Product prices and availability are accurate as of 2019-04-21 15:35:32 EDT and are subject to change. Any price and availability information displayed on http://www.amazon.com/ at the time of purchase will apply to the purchase of this product. 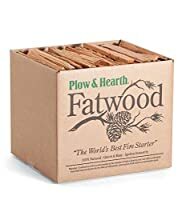 Plow & Hearth Exclusive - Fatwood is nature's best kindling! Loaded with organic resins that ignite instantly, our Resin-Rich, Easy-Start Fatwood Fire-Starter Kindling burns with an intense heat and gets fires going quickly! Just two 8"L sticks and a single match is all it takes. Every 8"L stick of our resin rich Fatwood is hand-selected and harvested from naturally felled trees (storms, lightning, old age). Our Fatwood is not the by-product of commercial logging or clear-cutting. Not a single live tree is used. 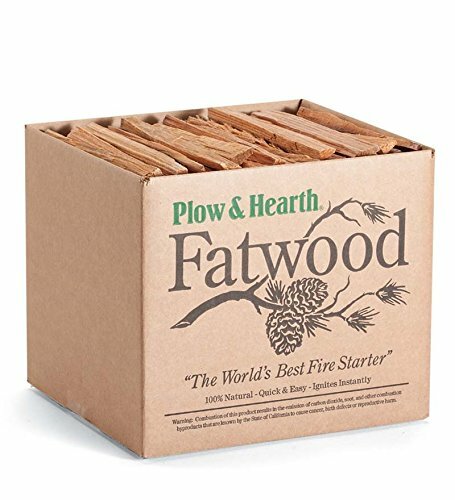 Plow & Hearth Fatwood is the all-natural fire starter. Fatwood fire starting sticks have an indefinite shelf life - fatwood even ignites when wet! Ideal for wood stoves, fireplaces, campfires, chimeneas, fire pits and more. Makes a great gift any time of year. USA/Imported. Size: 35 lb Box, each piece measures 8"L. Shipping: Ships within the 48 contiguous states only; Cannot ship to a PO Box. ATTENTION: This is an exclusive Plow & Hearth product that is only available from us. Please be sure to choose Plow & Hearth as the seller to ensure you are receiving a product that has been properly constructed and tested and that is supported by our U.S.-based Plow & Hearth team. No other sellers are authorized to offer this unique product on Amazon, and Plow & Hearth-provided warranties will be invalid for purchases through unauthorized sellers.